Canon Collins Trust invites applications from current 3rd year students (going into their 4th year in 2019) studying for an LLB at the University of the Western Cape & University of Fort Hare. 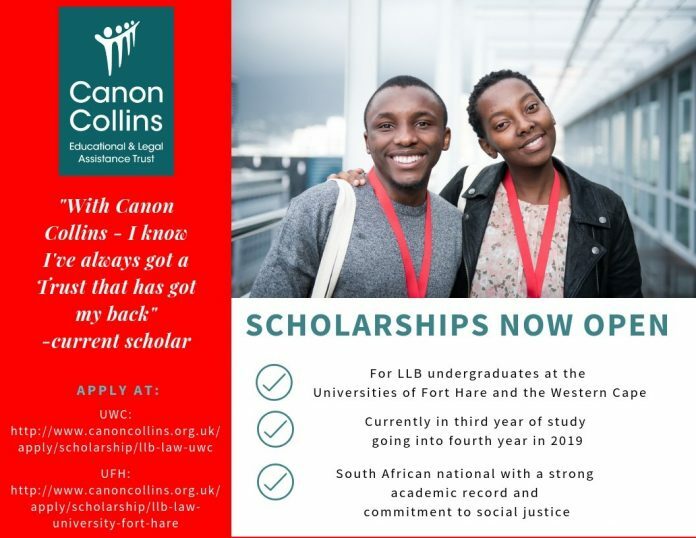 The Leigh Day Scholarships are for fourth year study in Law at the University of Western Cape. In possession of good results for completed years of study, or be able to demonstrate improvement. Awards will be R40,000 per academic year. We are now open for applications. Please refer to the guidelines for more information on this scholarship, and apply by downloading the application form and submitting it to [email protected] no later than Sunday 7th October 2018. The Leigh Day Scholarships are for fourth year study in law at the University of Fort Hare. We are now open for applications. Please read the guidelines for more information about this scholarship and apply by downloading the application form. Completed applications should be sent to [email protected] no later than Sunday 7th October 2018.